Predecessors of the International Criminal Court, the Nuremberg (November 1945 – October 1946) and Tokyo (May 1946 – November 1948) war crime trials represent a turning point in the development of modern international criminal law, laying the groundwork for the definition of war crimes and the prosecution of their perpetrators. This article presents the most valuable resources available online and at the ICRC Library on the subject, from historical sources to key academic publications. On August 8th 1945, the United States, England, France and the Soviet Union signed the Agreement for the Prosecution and Punishment of the Major War Criminals of the European Axis, and Charter of the International Military Tribunal. Best known as the “London Agreement”, it became the basis for a series of thirteen trials that were to take place before the International Military Tribunal at Nuremberg. Opened on the 20th of November 1945, the first trial saw 24 high-ranking Nazi leaders be indicted under one or more of four counts of the following crimes: conspiracy, crimes against peace, war crimes and crimes against humanity. This highly publicized trial has been the subject of numerous books and articles and remains the most well-known, in contrast with the subsequent trials held by the Nuremberg Military Tribunals which have been notably less studied, except maybe for the “medical case”. These twelve trials led by the American authorities prosecuted close to 180 members and allies of the Nazi apparatus: doctors (medical case), judges (justice case), military leaders (high command case), members of mobile killing squads (Einsatzgruppen case), industrialists and bankers, etc. Trial of the Major War Criminals before the International Military Tribunal, Nuremberg, 14 November 1945 – 1 October 1946. 42 vols. Nuremberg: IMT, 1947-1949. This 42-volume series, also known as “the Blue Series”, is the official record of the first Nuremberg trial. The library holds the British edition, The Trial of German Major War Criminals : Proceedings of the International Military Tribunal sitting at Nuremberg Germany in 23 volumes (without the reproduction of evidentiary documents) and the French edition, Procès des grands criminels de guerre devant le Tribunal militaire international : Nüremberg 14 novembre 1945 – 1er octobre 1946, in 42 volumes. Trials of War Criminals before the Nuernberg Military Tribunals under Control Council Law No. 10. 15 vols. Washington, D.C.: Government Printing Office, 1949-1953. This publication by the United States Government Printing Office, also known as “the Green Series”, is the official abridged record of the individual indictments and judgments, as well as the administrative materials that were common to all the trials. The library holds volume I of this series, The medical case. Law Reports of Trials of War Criminals, selected and prepared by the United Nations War Crimes Commission. 15 vols. London : His Majesty’s stationary office, 1947-1949. This 15-volume series presents the most important proceedings taken against individuals accused of war crimes during World War II, excluding the major war criminals tried by the Nuremberg and Tokyo International Military Tribunals. The library holds the complete series. The literature on the Nuremberg trials comprises personal accounts, accounts by historians and legal scholars as well as analyses of the trials’ legal aspects. Notable documents include The anatomy of the Nuremberg trials, a memoir by Telford Taylor who worked as an assistant to Chief Counsel Robert Jackson during the IMT trial and as Chief Prosecutor for the following Nuremberg trials. In Prelude to Nuremberg: allied war crimes policy and the question of punishment, Arieh Kochavi focuses on the complicated process that led the Allied nations to decide to prosecute war criminals in the first place. The Nuremberg trial and international law, edited by George Ginsburgs and V. N. Kudriavtsev, and The Nuremberg war crimes trial and its policy consequences today, edited by Beth Griech-Polelle, are two interesting collections of essays examining the IMT trial and its legacy. 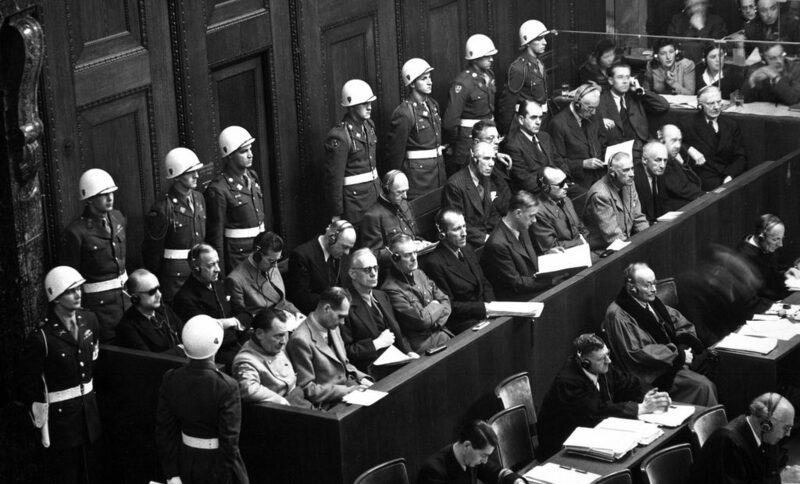 Regarding the lesser-known subsequent trials, The Nuremberg military tribunals and the origins of international criminal law by Kevin Jon Heller provides a comprehensive legal analysis of the twelve trials and their jurisprudential impact. Description of the International Law Commission’s work on the formulation of the Nürnberg principles with links to source materials. Documents related to the trial before the International Military Tribunal (IMT) and to the twelve subsequent trials, including trial transcripts, briefs, document books, evidence files, and other papers. The documents are part of a multi-stage digitization project. Numerous documents related to the proceedings of the International Military Tribunal, including rules of procedure, motions, presentations of cases, witness testimonies, etc. Nuremberg trial transcripts and documents from the collection of General William J. Donovan. A collection of documents, photographs, and writings by or about Robert H. Jackson and his career, notably as Nuremberg prosecutor (1945-1946). A historical timeline of the Nuremberg IMT Trial (1945-1946) that includes film footage. Alongside the Nuremberg and Tokyo trials, the lesser known United Nations War Crimes Commission worked between 1943 and 1948 to assist national governments trying war criminals. This website documents the history of its activities and gives access to newly uncovered related archival and research materials. The Tokyo war crimes trial took place between May 3rd 1946 and November 12th 1948. Twenty-eight high-ranking military and civil leaders of the defeated Japanese regime were charged with war crimes, crimes against peace and crimes against humanity. They were judged in front of the International Military Tribunal for the Far East, established by the supreme commander for the allied powers in Japan, General Douglas MacArthur. R. John Pritchard and Sonia Magbanua Zaide (eds. ), The Complete Transcripts of the Proceedings of the International Military Tribunal for the Far East, New York: Garland, 1981. R. John Pritchard and Sonia Magbanua Zaide (eds. ), The Tokyo War Crimes Trial: The Comprehensive Index and Guide to the Proceedings of the International Military Tribunal for the Far East, New York: Garland, 1987. Neil Boister and Robert Cryer (eds. ), Documents on the Tokyo International Military Tribunal: charter, indictment and Judgments, Oxford; New York: Oxford University Press, 2008. The Tokyo War Crimes trial has attracted considerably less critical attention than the Nuremberg trials. Studies by historians and legal researchers, as well as personal accounts by former trial participants, nevertheless provide critical accounts of its history and proceedings. In The Tokyo trial and beyond: reflections of a peacemonger (1993), Bert V. A. Röling is interviewed about his experience as one of the trial’s international judges. Held in Tokyo in 1983, an international symposium dedicated to the study of the trial from a legal and historical perspective reunited former participants, Bert V. A. Röling included, and scholars from multiple countries. Its proceedings are available for consultation in the ICRC library. More recently, in Beyond Victor’s Justice? : The Tokyo War Crimes Trial Revisited (2011), Yuki Tanaka, Tim McCormack and Gerry Simpson collect essays on the trial and its aftermath, addressing most notably its impact on international criminal law and the prosecution of war crimes. Finally, the volume Japanese war criminals: the politics of justice after the Second World War (2016), directed by Sandra Wilson, considers the geopolitical context of the trials and studies the influence of political considerations on the prosecution, imprisonment and/or release of Japanese war criminals. Digitized sources, including the indictment from the International Military Tribunal for the Far East and letters between trial actors. Foreign relations of the United States, 1946, The Far East, volume VIII. Documents 291-351. Apprehension and punishment of Japanese war criminals. Including numerous digitized resources (official records from the IMTFE, personal papers from members of the prosecution and defense sections, newspaper articles, and photographs) as well as video footage from the trial. Includes a link to the digitized guide ‘Researching Japanese War Crimes’. Including indictments, indexes of witnesses, court exhibits, analyses of documentary evidence, defense statements, and judgments.